100 yen shops are everywhere in Japan, and it’s amazing what products being sold at 100 yen. With all the different brands of 100 yen shops, are there any difference between them? 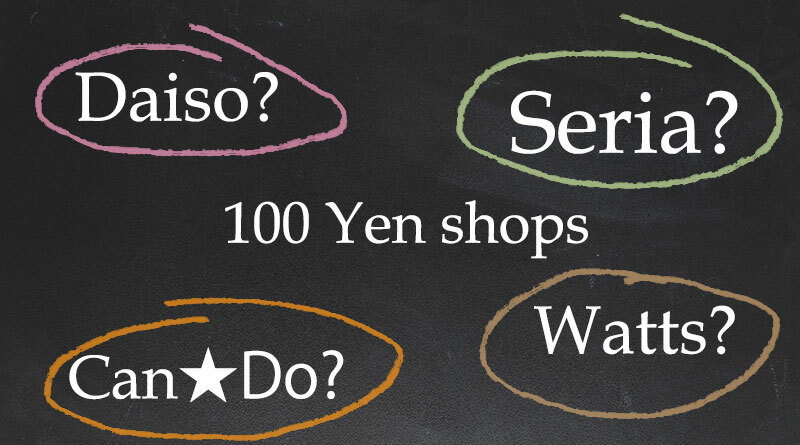 I’ll try to cover some of the main differences of the major 100 yen shop brands. Daiso is the big daddy of 100 yen shops, and is one of the must-go shops for tourists. Daiso sells a huge variety of products. By huge, I mean HUGE! Here is a short list of some of the product categories: kitchen goods, cleaning goods, stationery, storage, food and drink (even wine! ), cosmetics, toys, gardening, clothing, pet related goods etc. the list is endless. In fact, what don’t they sell? Daiso develops and produces their own products, including their unique and creative kitchen tools lineup. It is almost like the general DIY and grocery store, all in one. Daiso’s strengths as a company, and what makes them successful is based on their 3 values, Quality, Variety and Uniqueness. Seria uses the slogan ‘Color the days’, and their focus is on natural, stylish and simple products. Seria mainly sells interior products, kitchen goods, gardening and DIY (Do-It-Yourself) products. The Seria 100 yen shops target the female consumer audience with their chic and classy designed products. The Watts 100 yen shops were originally 2 different brands of 100 yen shops run by the same company, “meets.”, and “silk”, which merged together to form the Watts brand. Watts main focus are on stylish home accessories, and also stylish daily commodities such as kitchenware, stationery.